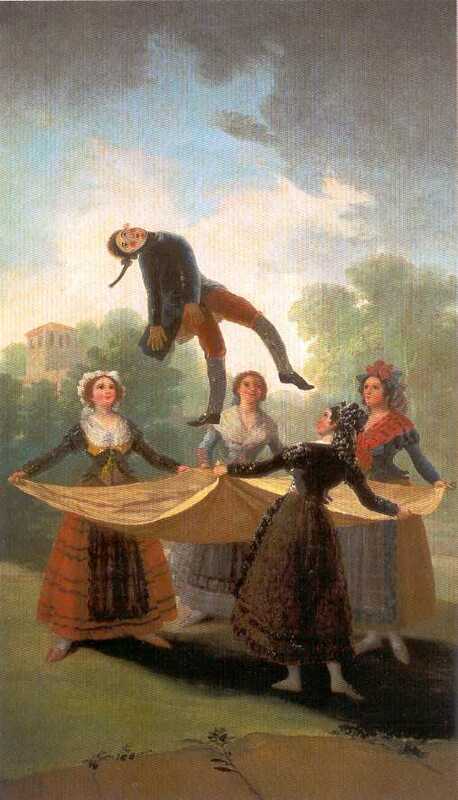 This is one of the 66 paintings Goya made for the tapestry factory in Madrid. It was the model (called a cartoon) for a tapestry. The technicians at the factory would copy it as exactly as they could with their colored wool. 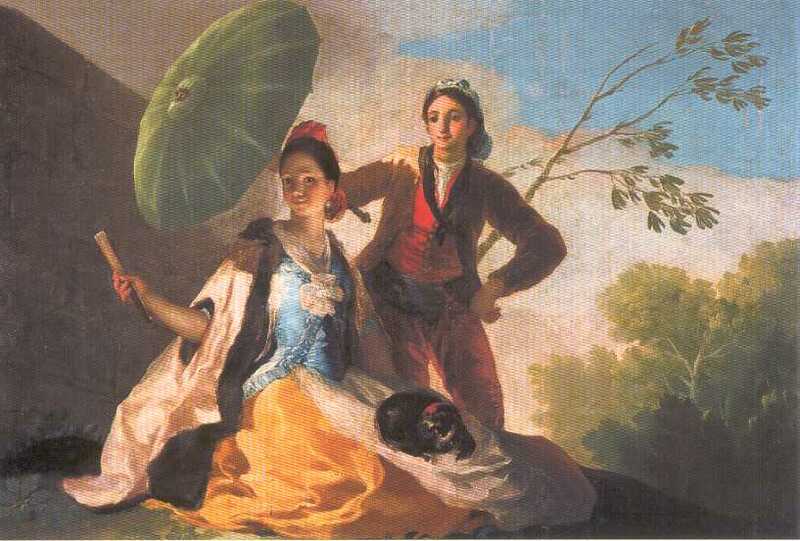 Goya’s designs satisfied them at first but later they complained that his cartoons were not simple enough, that they had too many shades of color. Who ordered all the tapestries? The royal family. They needed them to cover the cold stone walls of their palaces, such as the vast Escorial in the mountains northwest of Madrid. Tapestries keep down drafts and hold in the warmth. Was Goya free to choose a subject? 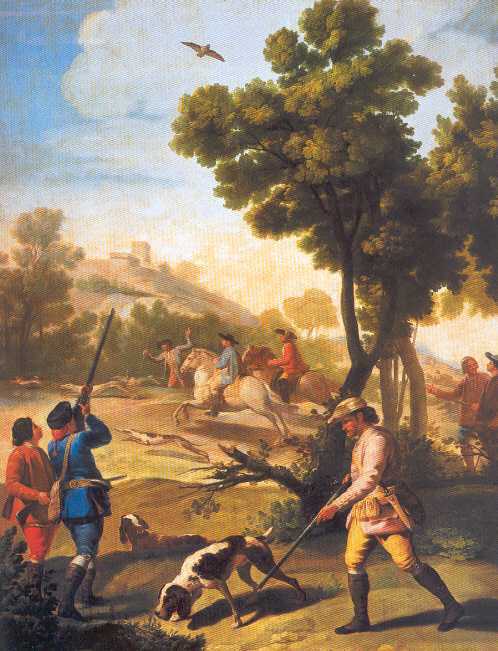 The king’s son, the future Charles IV, was crazy about hunting. He wanted to see pictures that made him recall the good times he had out in the woods with his gun and his dogs. …Buddy, your last verse killed me because when you talk about hunting you won’t believe how much I envy you. God just doesn’t want me to be able to run away from here [his atelier in Madrid]—for me there is no greater fun in the whole world. I went out just once here but nobody does better than I did: in 19 shots I bagged 18 pieces, which were: 2 jackrabbits, 1 rabbit, 4 little partridges and one big one, and 10 quail. This was in one day—the one I missed was a quail. I was especially happy because I happened to be with two of the best hunters around here and I earned myself quite a reputation among them…. Goodbye now. Tell your room not to forget me and my chair with the cigarette paper and tobacco. And the Prince’s wife, the Italian Maria Luisa de Parma, liked scenes of common people dancing or singing or watching bullfights. And there Goya had no trouble either: he had only to paint what fascinated him as well. He was a country boy who had only recently come to the capital, though he was no longer a boy at 29. Madrid was like another world to him—or like two. There was the secret world of the court and the nobles—one of wealth and power and beauty; and another equally exciting one of the common people, the majos and majas, in their way as proud as the nobles and whose life seemed even richer. Goya, whose imagination had no bounds (“I just never run out of ideas for a picture,” he wrote his friend), easily invented pictures that delighted both his royal patrons. These cartoons fill large rooms of the Prado Musum in Madrid and stand out for their happy, placid scenes and bright colors. So the shock is greater when the visitor without warning walks suddenly into the rooms with Goya’s “black paintings”. This entry was posted in art, art history, Goya, great artists, oil painting and tagged balck paintings, cartoons, Goya, pastoral scenes, Spain, tapestry. Bookmark the permalink. I went to the Wallace collection in London a couple of days ago –wow- The paintings by Boucher on the stairs were designs for tapestries too I think, they are amazing as is the whole place, quite breathtaking. Goya’s monsters, giants deserve a separate post. They’ll get one too, Erika–at least one. Robert: I wish could fly over to London to see the collection. I like the Madame Pompadour portrait by Boucher on the website. Very interesting! It didn’t occur to me that those tapestries also had a very practical side. Heating up those kind of mansions in winter was probably no easy job. Also surprising that “cartoonists” existed already at Goya’s times. The one in the background of Velazquez’ “Arachne” painting. You have some putti hovering around there, very skilfully placed, still enhancing the sense of background space and depth. sorry for deviating, but I’m overwhelmed every time I look at it. Pingback: The Power of Black and White imagery in Illustration | It's Me!